It all started with Parag bhai's intention to share the spirit of giftivism in our local Surat community. It's been inspiring to see the spirit with which such an intention has bloomed in just a couple short years. From Pinal and Nipun Shah's Awakin Circles to a pay-it-forward restaurant experiment, a grade 6 kindness tree, timeless Surat Smiles, and beyond-- the time was ripe for the local Surat community to gather for one and a half days of holding space for ourselves and each other in a field of maitri. One act of generosity overflowed into another and allowed a crew of about 45 of us to gather on December 4, 2015. The group was well diversified in terms of the backgrounds of the participants and also in terms of their age. From Gandhian elders like Arun dada to modern giftivists, to many engaged in social work, business men, and teenagers – we were blessed to be part of a group with a broad spectrum of perspectives. Deven initiated the retreat with a brief introduction, as the whole group stood in a circle holding hands, which was followed by prayers offered by Arun dada and Suchi ben. The group then proceeded to the Maitri Hall for a circle of sharing about their experience of having done an act of kindness for a stranger or about the experience when some stranger did an act of kindness on them and how it felt. There was some powerful sharing done which touched the hearts of all. Rahul shared an incident which moved him deeply, when he experienced compassion with a cat and felt like there took place an intangible communication between himself and the cat. Swara shared how an auto-rickshaw driver perceived from Swara’s phone conversation with her sister, that Swara needed to take some snacks for her sister but was running short on time as she had to catch a train. The driver took her to a shop and helped Swara buy the snacks and reach the station on time to catch the train. Audrey, who was visiting all the way from California, shared how it so happened that while she was walking, her steps happened to be in sync with those of a stranger walking close by. She felt a connection and smiled at the other person. The stranger later came and told Audrey that her smile made her day! Jitu bhai recalled his family’s trip to America where a taxi driver had been of great help to them. Dipesh bhai shared how complete strangers had taken care of him when on a motorcycle ride to Ladakh had left him feeling so dizzy due to the altitude that he had collapsed with all his gear on. Gauri ben fondly recalled how her family had given her a surprise gift of a car on her 50th birthday. Neha reminisced about her family’s trip to Manali where a local family invited them for tea. When they went, the family insisted that they join them for lunch every day. One day Neha and family went to their house for lunch, and were overwhelmed by the love that the local family showered on them. The host even made them wear their own wedding dresses and clicked pictures with them! Muni bhai shared how a poem written by a small girl studying in grade five had moved him deeply. Savji bhai shared how he felt when his son, while growing up, had become more and more withdrawn into his own shell. This made Savji bhai introspect upon his own relationship with his father. Monica shared how she felt humbled when a complete stranger helped her with a heavy bag which she was struggling with while traveling. Nipun bhai shared an incident he encountered at a dinner when a stranger sitting across the table took a morsel from Nipun bhai’s own plate and offered it to him. Shruti shared how once when she went shopping at a mall, she heard some commotion outside. She went to see what happened, and found that people had gathered around a small beggar kid and were blaming him for stealing some money. Shruti faced the crowd and helped defuse the situation. Then the child’s sisters thanked her and told her that their brother had not stolen anything and that they faced such situations frequently where they were innocent yet were always looked at with suspicion. Few days later while visiting the same mall again, Shruti forgot her vehicle’s keys in its ignition and went inside. Meanwhile the police had towed her vehicle. When she came out, she found those same kids were waiting for her to tell her that the police took her vehicle. Shruti was overwhelmed by this gesture. Siddhant recalled how Nipun bhai, Jayesh bhai and other participants had held space for him beautifully when he broke down while sharing at one of the previous start-up service retreats. Simmi recalled how people helped her when she slipped and her foot got stuck in a gutter opening. Madhushree shared her experience about while on the way back from Shirdi, they came across a private strawberry farm. Wanting to taste the strawberries, but not knowing whom to ask, she just shared her own food with the locals there and they in turn offered her those very strawberries. Sonia recalled the time she lost her wallet and went back to a shop she had been to recently, and they gave her back the wallet which she had misplaced there. Shalini reminisced about their family get-together during Diwali. She saw how the shop keepers were still working hard even on Diwali, and it moved her to offer sweets to the sweet vendors themselves. Nalini shared how her father had handled the situation when one of his employees had stolen some money. That same employee came back many years later in his own car, gave back the money and thanked her father. This moved her deeply. Pinal shared how when they were touring America, a local restaurant owner served them all the Indian food they wanted to have and did not charge anything. Rajesh shared how he offered some money to a kid selling pop-corn and the kid turned around and said that he won’t accept the money without giving Rajesh some pop-corn. Bhavya shared how auto-rickshaw driver helped her when she ran out of fuel in her vehicle. Karishma shared the connection she felt with some unknown kids when she offered them some food and then shared it with them when they invited her to join them. Sneha recalled an incident of when she was a kid and got lost, a stranger dropped her home safe and sound. Kalpesh shared how on a recent family trip, they visited a water fall. Being hungry, they looked around for food, but none was available. Just then a stranger offered them some biscuits. When he saw that the biscuits did not do justice to the family’s hunger, he offered them his own lunch which he was carrying with him. The hall was awash with the positive energy flowing from the collective state of being of gratitude being experienced by us all. 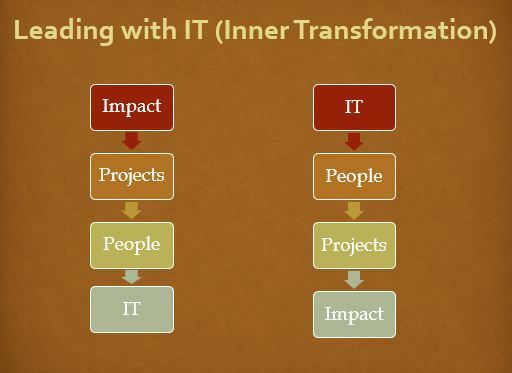 Nipun bhai then shared about his own personal journey a bit, and about ServiceSpace, gift economy, Gandhi 3.0 and the "many-to-many" model, and what happens when we flip the traditional mindset of "impact –> projects –> people –> inner transformation" into "inner transformation –> people –> projects –> impact". Post-lunch we broke out into small groups to explore various topics such as Parenting + Transformation, Social Media + Transformation, Business + Transformation, Daily Practice & Manifestations of Inner Transformation, and Education + Inner Transformation. There was some deep inquiry into the various angles of all these aspects, which brought to the surface some interesting questions. This was followed by a presentation by each group about what was discussed and their take-away from it. Later that evening, we sat in silence for some time to reflect on the day so far and soak it all in. This was followed by a silent dinner. The space for the dinner was beautifully lit up with diyas, delicious food was served, and to top it all, Shalini and Rahul spontaneously started singing ‘Hari Narayana’ taking every volunteer and every participant’s names one by one with every line of the song! Every heart present there was beating as one. There was no other. Many would later share that they found this experience very powerful, beyond what the mind and logic could grasp and what words could communicate. Everyone gathered around Arun dada and Rahul post dinner while they sang some bhajans and also shared the meaning of the bhajans they were singing. How blessed we felt to have got this opportunity to just be there and hold each other in this space! With hearts flowing over with gratitude, some of us called it a day while some of us mingled over a bonfire, sang songs, shared jokes and just did some masti! Next morning Arun dada led us on a ‘Prabhat Pheri’ followed by which some of us sat in silence in the Maitri hall. Post breakfast, Nipun bhai talked about Gratitude and shared some personal stories about how he had experienced the power of gratitude. He introduced the group to the spirit with which two monks embarked on a pilgrimage of peace, taking three-steps-and-a-bow across 800 miles over 2 years and 9 months. Mukesh Anand then led the group on the gratitude walk, taking three steps and a bow, silently expressing gratitude for all the blessings that life has bestowed upon us. As we all did this walk, the realization and feeling of gratitude over-whelmed anything and everything the ego could come up with. All eyes were moist with tears of gratefulness, and we experienced what true happiness probably feels like. Everyone sat with their eyes closed and shared what they experienced. Everyone tried, yet we all realized how inadequate words are to describe something like this. Thank you Mihir for capturing the beauty of those one and a half days here. I love what Parag-bhai shared, "I feel short of words and i guess so do you all when someone asked us how was the retreat ? . I was thinking about the magic what we all experienced and realize that love was the guiding force in all our actions. The Organizing principle for the retreat was love and what we all experience is power of love and it is hard to describe in words which is beyond words."